Studio Drift has been selected by Microsoft in collaboration with Artsy to create the first mixed reality (augmented reality) art piece for the Microsoft HoloLens. The work has been presented at the 2017 Armory show New York. On first impression, visitors experience solid forms, which draw on minimalist motifs and underscore the stable properties of concrete. While wearing the HoloLens, viewers enter a mixed reality, enlivened by responsive holograms that augment the physical environment of the installation. With Concrete Storm we explore the layer between the parallel worlds, whereby the real and the virtual worlds co-exist. Our attention is now constantly devided between these two worlds that we coexist in. We believe that combining these two seemingly seperate worlds we can study the unlimited possibility's of our unstoppable evolution. Concrete Storm expands our boundaries of the digital world, unbound from screens, and integrated into the fabric of our physical existence. 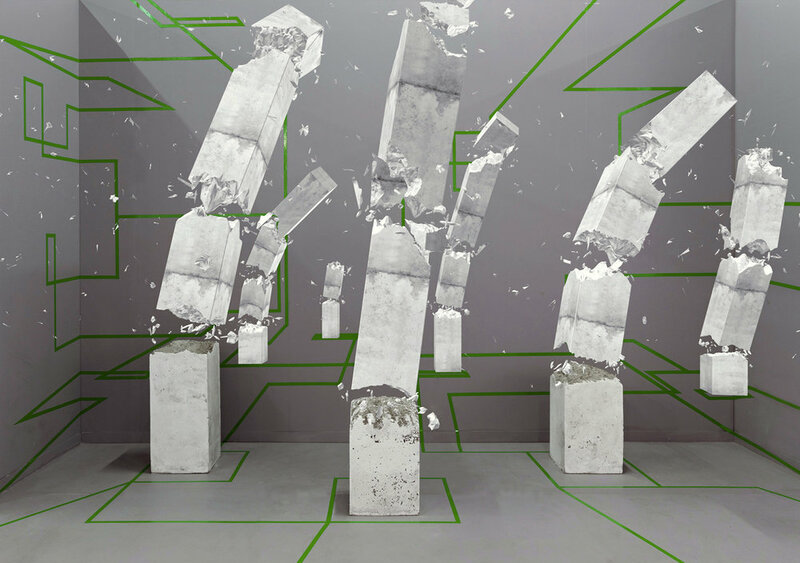 Concrete Storm is the first mixed realty work merging the 'real' and the digital world in partnership with Microsoft HoloLens.